I took a last minute trip to Florida at the weekend, to try again for some mammals I’d failed to see in January. 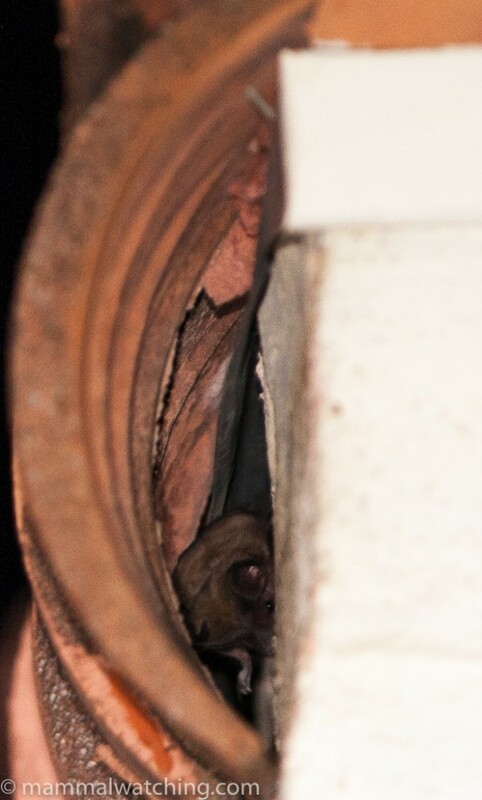 It was 10 – 15 F warmer in mid March than it had been during my January visit, and so I was optimistic the Florida Bonneted Bats would emerge from their roost in house roof in the Miami suburb of Coral Gables. They did, at exactly 30 minutes after sunset. 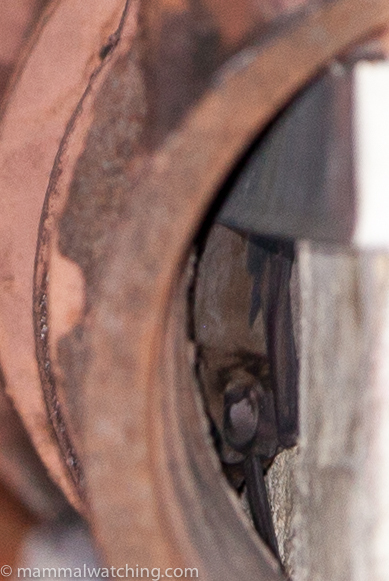 I got a few – rather bad – pictures of some of the bats before they emerged from the roof. This species is barely known and I believe only a handful of roosts have been discovered. While I was waiting for the bats with my eyes glued to the roof of the house they roost in, some rustling in a Strangler Fig caught my eye and I saw the silhouette of what appeared to be a mouse moving along a branch. It disappeared into the adjoining tree. 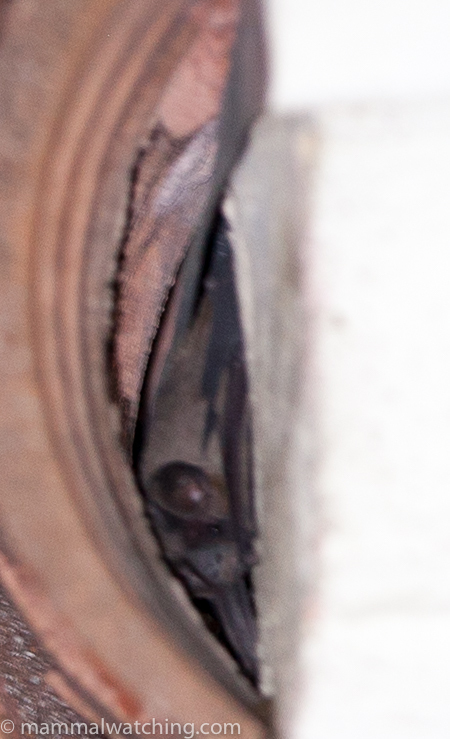 I didn’t want to take my eyes off of the bats so only spent a few seconds looking at the mouse. Given its size the only possibility is, apparently, a Cotton (Deer) Mouse. From Miami I drove a couple of hours north to the Kissimmee Prairie Reserve where Eastern Spotted Skunks are seen from time to time. In January I’d seen a Striped Skunk here but no Spotted Skunks. This evening there were more mammals running around, including several Opossums and Raccoons, some White-tailed Deer and an Armadillo. And I smelled a skunk. But I didn’t see one. The next day I headed up to the Gainesville area, which seems to be one of the better places to look for Round-tailed Muskrats, a.k.a Florida Water Rats. This is another species I have failed several times to see and it is getting annoying. I spent a few hours at Payne’s Prairie Reserve, just south of Gainesville, which boasts a healthy population of the muskrats. But they are hard to see, not least because the park closes at sunset. When I spoke to two park staff they proudly told me that, other than the stuffed one in the visitor centre, they had never seen one in X years (where X was at least 10). Undeterred I tried looking along the La Chua trail as this appeared to run through good habitat. I later learned that there are lodges near the end of trail, though I didn’t have time to get that far lest I was caught in the park after 8 p.m (though later learned that isn’t as problematic as I had thought). I saw only a sounder of Feral Pigs. Highway 441 runs through the park and across a swampy lake. Muskrats are seen – very occasionally – crossing the road. It was a lot busier than I’d expected so spotlighting from a vehicle, as I’d planned, isn’t an option. Walking along the shoulder with a light would be safe enough, but there is so much traffic noise you’d have little chance of hearing any splashes so would need to be very lucky to see an animal. I didn’t even try. I did walk along the short observation boardwalk, that runs into the swamp off of the highway (about 6 miles north of the town of Micanopy). Within 20 seconds of reaching the end I heard – and then saw – my first Marsh Rice Rat moving through the swamp and climbing up some grass, about 45 minutes after sunset. I think this species is abundant here. I will return next month and try again for both the Skunk and the Muskrat, though I will be with my kids who are currently under the impression that the trip is more about Harry Potter World than mammals. Oh well kids…. Sorry! These skunks and muskrats seem to be coming an obsession. Perhaps next time you can book a cabin in Mike Roess Gold Head Branch State Park (see my report). Give your kids a stack of Harry Potter DVDs to watch while you spend a couple of nights spotlighting around the lakes. Every one’s a winner! Jon, I spent a night in a cabin at Mike Roess SP last June. I didn’t see any signs of muskrat houses on either lake but I went spotlighting by foot and car that evening and before dawn the next morning, pretty much covered every trail and road. No luck, obviously. The ranger on duty was pretty chatty and I got the impression that the biologists who did the work had to go off trail into the boonies. 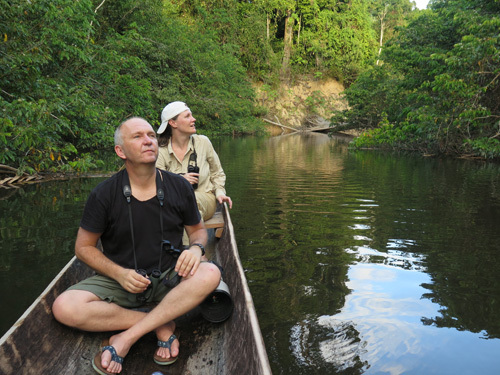 It might be worth getting in touch with the biologists directly and get more specific information. Good luck! Thanks John, that interesting to know (albeit depressing!). 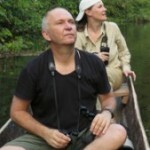 I am chatting with the biologists at the moment. A student just finished her masters on the muskrats and it seems like she found most sign of them at Mike Roess on the two lakes near the campground. Though they are extremely hard to trap and I am not sure if she actually saw any animals! I live in Gainesville. The next time you come to the area you need to give me a call. You would be welcome to stay at our place anytime. I have seen one Round-tailed Muskrat near Gainesville about 20 years ago. I will see if I can’t find out some info before your next trip this way. A very good friend of mine is a Biologist at Paynes Prairie. I will give him a call this week.